During the same expedition in Mongolia that uncovered Protoceratops and Oviraptor, another genus of dinosaur was discovered, and it was Henry F. Osborn who first described it. The creature was named Velociraptor. 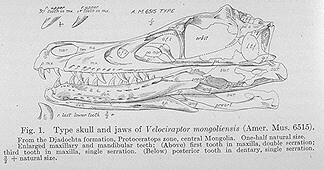 The recovered specimen comprised a skull with jaws, and claws. They indicated that Velociraptor was a small and swift predator. A single creature was probably incapable of inflicting serious damage to large creatures, but its speed of movement was of interest to palaeontologists, and proved to be an inspiration behind Spielbergs raptors in 'Jurassic Park'.